My newest project is this fish platter. 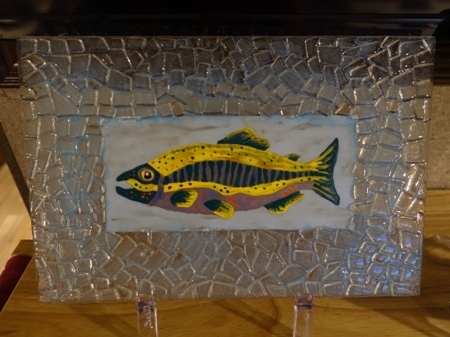 It is hand painted with glass enamels and bordered with hand cut clear glass chips and some glass powder. This is contour fused and ready to slump into a 8x12 rectangular platter mold. I am still living in my motorhome and only brought clear glass to work with. 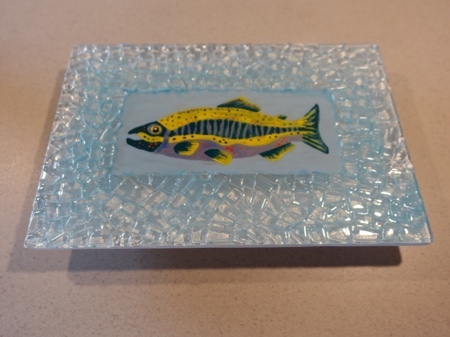 This piece was created to use up a lot of scrap glass that has accumulated after cutting out circles. I did my contour fuse at 1400 this time and I am happy with the softer rounded edges of the chipped glass.